Various lengths of warp. Chain unmeasured. Electric pump not connected. Manual pumps of the 'stirrup' type. A Longboat with a cabin designed to appeal more to private buyers than the open version, the Cruiser Longboat was introduced and sold side by side with the standard open boat. Introduced in 1970 and replaced in 1979 by the Coaster. Over 400 were built. Cruiser Longboats or, if you prefer, Longboat Cruisers have crossed the Channel, even oceans, but are ideally suited to creek crawling and coast hopping. Our example here is believed to be an early 'prototype' model of the Longboat Cruiser, possibly #11, with in my view better locker arrangements in the cockpit and a larger and centralised companionway access to the cabin than later models like the one I recently owned. 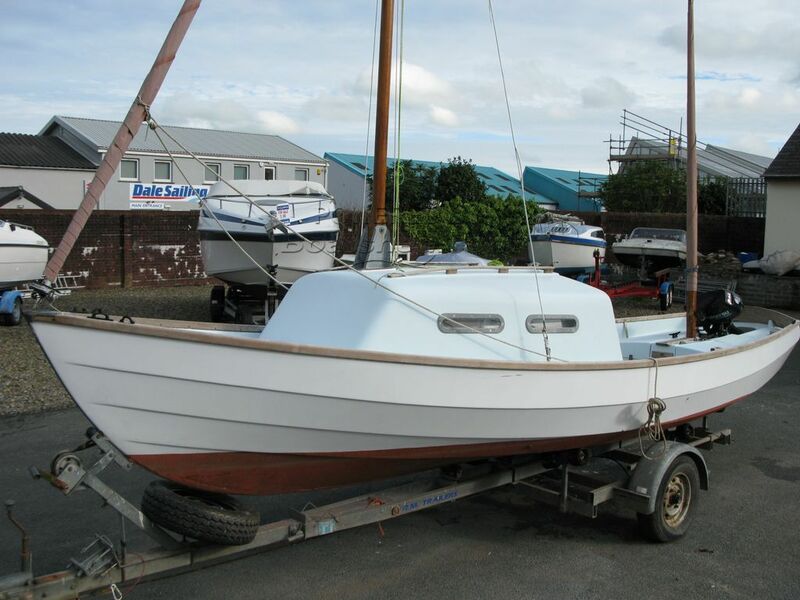 She has also benefited from regular upgrades and professional boatyard attention over the years (lashings of cash!) as well as a new engine in 2016. She also has what appears to be a nearly new canvas cockpit cover/boom tent. The Cruiser Longboat, with her boomed mains'l, is a joy to sail and moves elegantly in the lightest of airs and her yawl rig is ideally suited to shorthanded or single handed sailing. She is in need of a new owner who will continue the pampering which she has enjoyed to date. Read Hans Vandersmissen's 'The Shallow Sea Drascombe' for inspiration but beware - you might catch Drascombe fever like I did! This Drascombe Cruiser Longboat has been personally photographed and viewed by Alan Coy of Boatshed Wales. Click here for contact details.